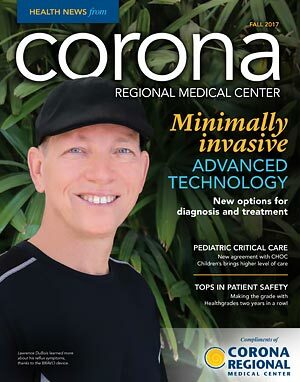 Health News from Corona Regional Medical Center is a publication designed to bring you the latest news as well as health and wellness information you can use throughout the year. You can read the latest issue here, or sign up to have Health News mailed directly to your home. An agreement with CHOC Children’s brings a higher level of pediatric care to Corona Regional Medical Center. The agreement means greater access for high-risk and critical care pediatric patients who come to the ER. Recently acquired equipment at Corona Regional Medical Center can make a big difference in identifying and treating conditions related to gastroesophageal reflux disease (GERD), lung cancer and other conditions, as well as blood clots in the lower extremities. The only ER in Corona, Norco and Eastvale, we recently unveiled a new addition, with more room to serve you with separate walk-in and ambulance entrances, shelled space for future patient rooms and more. If you are a current or former smoker, you may be at risk for lung cancer. But with low-dose CT screening, cancer may be detected in its earliest, most-treatable stage, before symptoms even develop.